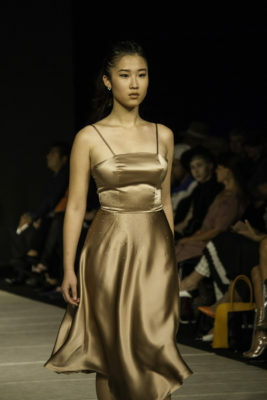 Sept. 18 marked the beginning of the 29th season of Vancouver Fashion Week, showcasing more than 80 local and international designers. This year’s show focused on multiculturalism not only in designers and styles, but also in the models wearing the clothes. On Friday, Day 5 of the show, the runway was taken over by 13 different designers who all had something unique to showcase. The evening opened up with Mary Ebra, followed by Rebeca Rebeca, Chen x Chen Design, A.SEASON, Toia, Book on the Park, Stepanova Clothing, Port Zienna, Fiction Tokyo, Srishti Kaur Designs, D’GRAPH, ANDRE and the evening closed with looks from the CHENLOHENKU collection. The A.SEASON collection sported long trench coats and jackets in a variety of neutral colors from a subdued tan to creamy white to an olive green. The models wore slicked back ponytails with natural makeup and minimal accessories to extenuate the contemporary handmade cashmere coats with muted tones. Next, Toia took the stage to offer stark contrast to many of the minimalist looks sported on the runway this season. The collection was composed of a variety of bright colors that threw a nod towards styles of the 1960’s. The unique orange floral patterns and sophisticated structure can be found sprinkled throughout the collection. All seven of the looks melded together beautifully following the same florescent orange, yellow and denim colour scheme. Book on the Park followed up by debuting a full menswear line that was sleek and used vivid reds throughout. The collection uses polkadot patterns and ball caps as a staple while also relying on layers combined with simple patterns. The collection was inspired by a Korean novel called Mr. Monorail and each colour within the collection was used to represent a different character in the book. Stepanova Clothing was brought forward by Melbourne fashionista Avril Stepanov. The Australian designer used textures and delicate embellishments to create a whimsical collection. The featured gowns and formal wear made out of silky and sparkly materials create a glamourous and luxurious look. Port Zienna’s founder Francesca Canepa is an emerging designer from Lima, Peru. Her collection was focused on minimalistic designs using black and white as its primary colours. These simple and chic looks made good use of symmetrical lines and were complemented by the models’ dramatic eyeliner and otherwise simple hair and makeup look. The collection was made from sustainable eco-friendly fabrics manufactured in Peru. Canepa used the draping tradition of haute couture, creating uniquely contoured clothing throughout her collection. Fiction Tokyo is an independent fashion label created by Monaca Nishi, the collection was focused on female empowerment and confidence and used sheer fabrics, cool colours and simple textures that are influenced by the unique street fashion from Tokyo. The collection was nicely complemented with eccentric accessories and glittery makeup. This week-long fashion event showcased styles for the upcoming 2018 spring and summer season.